Charm pendants are all the rage. Varying in size from tiny initials in sterling silver (or special order gold vermeil) to larger rounds, ovals and rectangles- charms are the IT necklace du jour. We especially love the epoxy message charms (top right). These are hand screened prints placed under an epoxy "gem" and strung on to a silk cord. Subtle messages are captured in a whimsical yet poignant way. One of our newest best sellers are these tiny initial charms- only about 1/4" in diameter they flatter every wearer and look great worn alone, grouped together in sets to form words, or reworked with other charms you may already have. And of course. 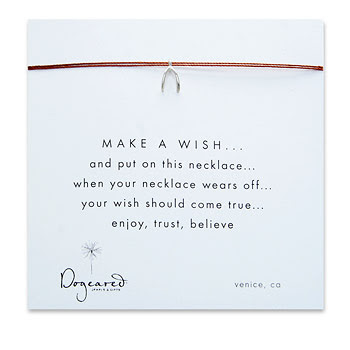 let's not forget the ever popular wish necklaces from Dogeared. Delicate charms are strung on cording that eventually wears away granting the wearer their wish. Placed on mounting cards with pithy messages- these charms ensure all your dreams will come true!